It was days after the 2016 election when Joseph Weidknecht, a Trump supporter sporting a sign that read “Proud to Be Deplorable” and a “Make America Great Again” cap showed up at a march protesting the election of Donald Trump in Austin, Texas. 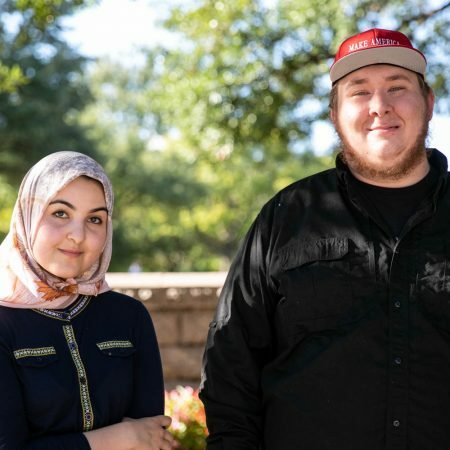 Amina Amdeen, a Muslim student at the University of Texas, was one of the marchers who came to the peaceful rally that day before part of the protest broke into violence. Though they come from opposite ends of the political spectrum, they came to StoryCorps to remember a moment that day that unexpectedly brought them together. Presented through One Small Step, StoryCorps’ national effort to encourage people to engage in a conversation with someone they may not agree with politically. Produced by StoryCorps. Originally aired September 28, 2018, on NPR’s Morning Edition.